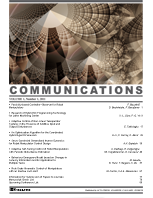 This is an interdisciplinary journal focusing on theories, systems, methods, algorithms, modelling and simulation, and applications in communications. The interdisciplinary approach of the publication ensures that the editors draw from academic researchers, industrial professionals, engineers, consultants and educators worldwide working in a diverse range of fields to contribute and spread innovative work on communications. The scope of Communications includes: all areas of wired and wireless information communications technology including:, wide- and local-area networks, Wi-Fi, cellular systems, mobile ad-hoc networks, communication systems and networks, wireless personal communication, modulation and signal design, speech, image and video communications, coding theory and applications, media access techniques, synchronization, channel equalization, detection and estimation, multiplexing and carrier techniques, software-defined radio, switching systems, routers, protocols, standards, network management, mobility management, spectrum management, resource allocation, network reliability and survivability, performance, quality of service, network design and optimization.